Fusion Performance Group | Strategy. Execution. Achievement. Financial industry sales training and leadership development to build your high performance team. High performance teams that deliver sales, market share, profitability and client satisfaction don't just magically happen. Leveraging web based applications to deliver cost effective on-demand skill development. "Everyone in sales should sit through one of Kevin’s presentations. The slightness changes to your process; I think it would make a big difference in several areas (relationships, rapport, sales etc.) from the knowledge Kevin leaves you with at the end of his session." "During my tenure with Canadian Western Bank, I had the pleasure of working extensively with Warren and the team at Fusion Performance Group. They are experts at what they do, always professional, thorough and engaging, and deeply committed to ensuring the best possible service for clients." "We looked at a number of different companies that could help develop a more proactive service culture and selected Fusion Performance Group because of their unique approach to selling. What they do is different then the typical "product push" style of suggestive selling that is out there. " "As the Director of Member Sales & Service I had the pleasure of utilizing Fusion Performance group to provide sales & service training to over 1300 employees at Servus Credit Union. Warren and his team did a fantastic job of achieving Buy-In from our retail team and helped us create a more proactive member focused sales/service culture... highly recommend Fusion Performance Group"
"The activities and dialogue presented in the training have given us more confidence in approaching both existing clients and new prospects. The dialogue is from the perspective of offering assistance and solutions to problems that a client or prospect might be having, rather than looking to push a product or solution on the client." "Chris gave me great examples and statements to take back to work and put into practice. The course has provided me with service skills to provide members with the help they need. I feel more comfortable than I did." "Our CU has used Fusion Performance Group in the past and we rely on this training to serve as our culture. We have seen vast improvements in the past 3 years due to this training." "Facilitator was extremely professional and taught me how to have a soft approach with a strong impact on the member and his life/services. I believe that CFCU will benefit from all of this information and apply it to our everyday business. Warren kept our attention riveted on his discussion and his comic approach and easy manner of explaining himself was profound." "I like the way the selling process is translated into the coaching process. They are interrelated and will be easy to remember. Chris was a great facilitator, kept the group engaged, & I think this information will really help us getting from Good to Great Member Service. Thank you!" "Congratulations Warren, not only for this milestone but for being such a significant contributor in building a number of very successful training companies including the one that has worked so successfully with our company." "This is a course that every sales oriented company should provide for their employees. Especially in this day & age where texting and electronics are taking over. Uncovering the member’s needs is crucial. Great job." "I feel after my sessions with Warren I have better ways of asking for business and uncovering future business potential. These tools have assisted me thus far and now I have more to increase my service to the member with increased value." "People are a company’s only long term sustainable competitive advantage so train them right and treat them right." "After our implementation of FUSION we have seen a fantastic change in our numbers. In 2013 we experienced one of the best years in a long time. And 2014 is shaping up for us to exceed our profitability by a fantastic margin. We have seen growth in all areas these past two years. We are in fact achieving the success we had hoped for." "Chris is an adept & skillful presenter who is able to engage a room. His training process and how it connects together is brilliant, & gets the buy-in from participants as each step of the way." "I’m a typically pessimistic person, but this course has really opened my eyes to a world of new opportunity...and it was always right there. I’m excited to make this work when I get back and am optimistic it will be the start of great change." Increase products and drive key performance indicators by having your entire organization engaged in the right activities. 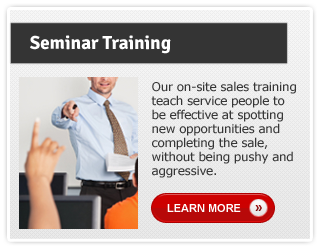 Give your employees the necessary sales skills training courses to sell professionally and improve client satisfaction. Don't wait to start training! Powerful cost-effective self-study sales training video series available from your office or home.